« The Helle Temagami ~ a Great Bushcraft Blade! 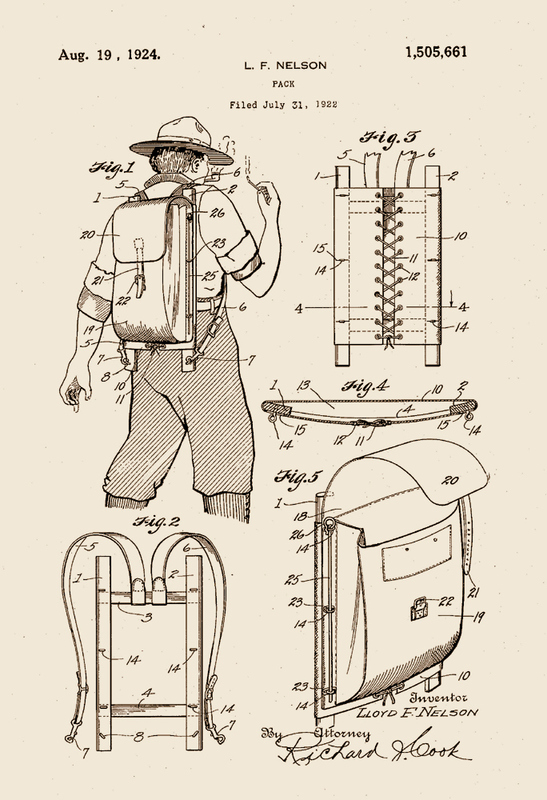 The Trapper Nelson Indian Packboard, patented by Lloyd F. Nelson in 1924, represented a significant advancement in pack design, appearing on the market near the end of the classic camping era. 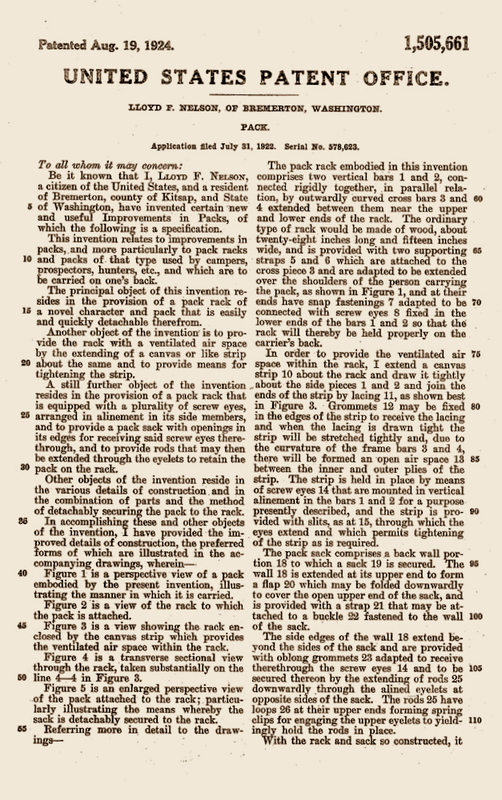 The pack was first conceived after Nelson used an Indian packboard on a tramp in Alaska in 1920. The native-made article featured a stretched sealskin, stiffened by a willow frame. Though Nelson found the packboard uncomfortable, he considered it an improvement over the popular Poirier (Duluth) pack that dominated the field at the time. Nelson was confident that he could produce a pack superior to anything then available with regard to distribution of weight, carrying comfort and carrying capacity. Working nights in his basement, Nelson came up with a wooden frame, braced with cross slats, a ventilating canvas back panel and a quickly detachable canvas packsack. Nelson invented the concept of hanging the packbag from the frame by running a heavy wire rod through a set of screw eyes attached to the frame and inserted through grommets in the packbag. To remove the packbag, one only had to pull the two heavy wire rods out of the screw eyes and give a tug to the packbag. This method of bag attachment was copied by Kelty and other pack makers decades later in a slightly modified form (Kelty replaced the screw eyes with aluminum aircraft rivets that Kelty drilled holes through, to accept the wire (now known as a clevis pin). 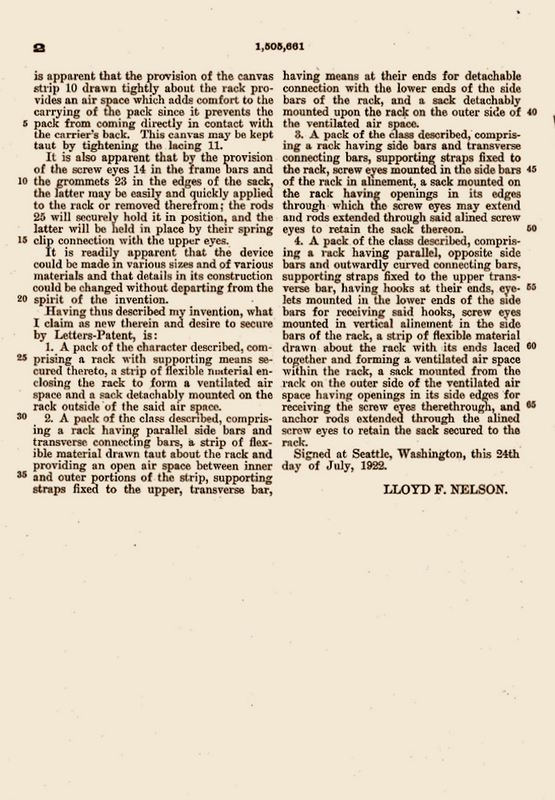 In his U.S. Patent application, Nelson noted that his packboard could be produced in various sizes without departing from the spirit of the invention. This was easily accomplished by simply lengthening or shortening the frame rails and wires and adjusting the number of screw eyes. Though considered crude by today’s standards, the Trapper Nelson represented a breakthrough in pack design. Nelson predicted that the new pack would be popular with trappers, foresters, miners, surveyors, timber cruisers and Boy Scouts, which it did, after a slow start. Nelson worked tirelessly, carrying a sample pack on his back into every sporting goods store from San Diego to Seattle. Orders were slow in coming but as sales began to improve, Nelson soon encountered problems. Attempting to sew the packbags himself, and combining them with a frame made to his specifications, Nelson found that he could not produce the pack quickly or efficiently. In 1929, he contacted Charles Trager Manufacturing of Seattle, Washington, a producer of lumberjack supplies, to have them produce the pack. According to the Trager website, Nelson sold the business to Trager but he must have retained some rights as he later negotiated agreements with manufacturers in Canada to produce the pack under the Trapper Nelson name in that country. Just weeks after the agreement with Trager was completed, Nelson was asked to fill two orders totaling 1000 of the packs by the United States Forestry Service. From that point on, the Trapper Nelson became the dominant pack for overland hikes and tramps in North America. The Poirier pack was forever relegated to canoe tripping (as a portaging pack) after Lloyd Nelson’s pack became popular. Unbelievably, Trager produced the Trapper Nelson in the United States until 1986, long after the development of the modern aluminum external-frame backpack. Trapper Nelson packboards remain highly popular with Alaskan hunting guides and prospectors, who consider them superior to modern aluminum frames for carrying the heavy loads associated with those activities. I purchased an old, beat up Trapper Nelson at a swap meet about eight years ago, to serve as part of the décor in my son’s “Boy’s Life”, circa 1950-themed bedroom. I think I paid $5.00 for it. The bag was in fair condition, the frame was in very good shape with only a tiny crack in a cross brace and everything was there. The metal components that had originally been brass or nickel plated were rusted but the three galvanized heavy wire rods, used to attach the packbag to the frame and to connecting the cross braces, were in perfect condition. Sadly, the previous owner carved his name in one side rail and drilled a number of random holes through the lower frame on both sides. I carefully washed the packbag, applied Lexol to the leather conchos (rivet reinforcements), oiled the frame with linseed oil and stuffed the old packbag with plastic and newspaper to give it shape. It then rested in a corner of my son’s room until a few months ago. Desiring a new look to his room at age 17, I came home to discover that the old pack had been relegated to the Goodwill pile. WHAT??? Give this wonderful traditional pack to Goodwill? No way! I decided that I would restore it! Pulled the heavy wires out of the screw eyes that are used to affix the bag to the frame. Pulled the canvas packbag off the screw eyes. Untied the cord tightening the ventilating canvas backrest around the frame. Removed the galvanized heavy wire that connected the cross braces. Removed the steel screws that attached the oak cross braces to the pine frame. Removed the brass-plated steel end caps and nickel plated steel shoulder strap clips from the frame. Now the various components were ready to restore or replace as needed. I glued the crack in the cross-brace and then went to work on the side rails. After spending several days filling the random holes and gouged owner’s name in the rails and sanding/refinishing the frame, I decided that I would never be satisfied with the results. 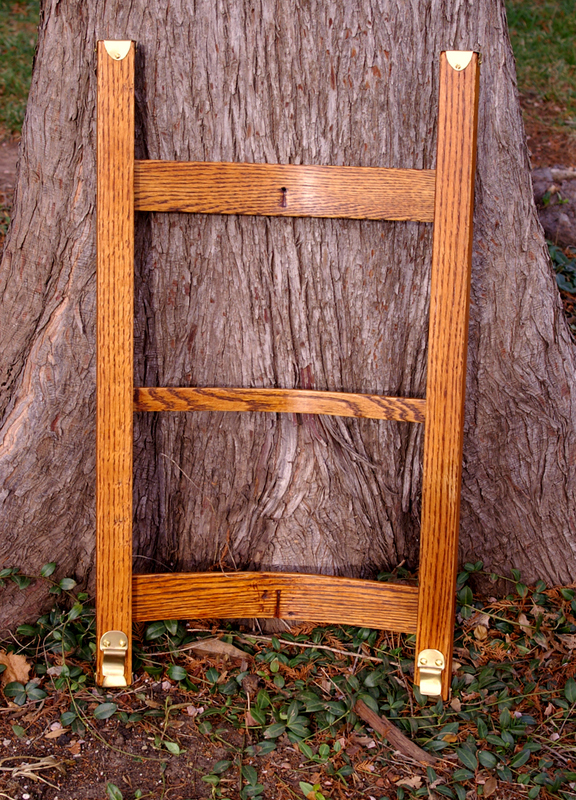 I had my brother-in-law, a custom cabinet and furniture maker by trade, make new side rails in straight-grained oak to match the cross braces. The difference in color between the new side rails and the 60 year old cross braces was significant so I had to stain the new wood to even things up. After staining, the frame components were given a couple of coats of teak oil and the cut ends of the side rails were sealed with three coats of spar varnish. Then, the frame was hand-rubbed with a linseed oil/beeswax mixture. The rusted steel wood screws and screw eyes were replaced with new solid brass hardware. The end caps were re-plated in satin brass as original, and mounted over the sealed ends of the side rails. The clips that accept the shoulder straps (originally nickel plated) were brass plated in order to provide for a more uniform appearance. The galvanized wires that affix the pack to the frame were heavily plated in nickel and given a satin finish. All of the new and newly-plated hardware was left unfinished to allow everything to oxidize beautifully over time. Here is the side of the frame showing the clips that accept the ends of the shoulder straps (lower frame). This is where things stand at the moment. I plan to replace the galvanized, heavy wire rod that connects the cross braces with one of solid brass (not seen in the photos here). The packbag is very simply made and I think I could replicate it myself but I wanted to add some features so if anyone knows of someone experienced in sewing canvas, I may decide to have them make the packbag. I already have a source for the leather for straps and pack harness if things work out. The packboard as viewed from the top. The brass end caps have been beautifully re-plated. I’ll update this post as the project continues to progress. This entry was posted on Friday, December 28th, 2012 at 10:46 AM	and is filed under Traditional Camp Equipment. You can follow any responses to this entry through the RSS 2.0 feed. You can leave a response, or trackback from your own site. At the 1st annual Woodsmoke one of the projects was to build from scratch the Trapper Nelson Pack Board. I was one of the lucky ones to be able to take part in this project. Dave Wescott brought in an expert seamstress to design and sew the canvas packs for us. I am forever grateful for building this pack. I was going to write an article of my experience making this pack and showing pictures along the way. I can share some pictures of my pack if you would like to see it. I really like how your pack board turned out and really like the brass hardware. Thanks for sharing. It’s nice to hear from you. I really wish I’d been able to attend last year. The Trapper Nelson workshop is one I would like to have taken part in. You are fortunate to have been there. I’d like to get in touch with that seamstress! Maybe she could help me with the packbag. I’d love to see your photos, I’ll email you today. I’d really like to know how you bent the cross braces and if the packbags were attached to the frame in the same way as this pack. Thank you for contacting me. I am excited to have found you story! I bought my Trapper Nelson in 1972 and have been in love with it since. The pack saw an extreme amount of use until marriage and the family came. So, after three decades in the attic I got it down, cleaned it off hoping some of the family would want to use it. There was little interest shown and it somehow found it’s way into a barrel with a few inches of water where I found it last summer (I don’t know how long it sat in the barrel but long enough for mold and rust to appear). After a cursory cleaning it was put it in the sun to dry. After my son-in-law asked to borrow it yesterday, I thought I’d better get to work. I have the packbag in the washer now and, if the canvas is too far gone, will want to find someone to duplicate the bag for me. Wish me luck, I love the old girl and want to bring her back to life – she’s a gem. Hi I bought a Trapper Nelson Pack at a goodwill store in Oregon. it is in good shape it needs new leather staps for the flap closer and I would like to change out the shoulder straps to accomidate my wide chest and have them lengthen to fit me. The frame is solid and all the metal hardware is in good condition. I live in Olympia Washington and if any one knows of some one who is good at these repairs or replacements drop me a line. 360-489-1347. I have an old back pack I just to know more about. I’ve had since 1970, a friend gave it to me. It has the name Louise bunny Marshall felt penned on it. I could send a picture. All Trapper Nelson packs, whether made by Trager or Canadian manufacturers like Pioneer, look very much alike. All were squared canvas bags that closed with a flap, most having a single outside pocket with a flap/snap closure (early models) or with a metal zip closure. 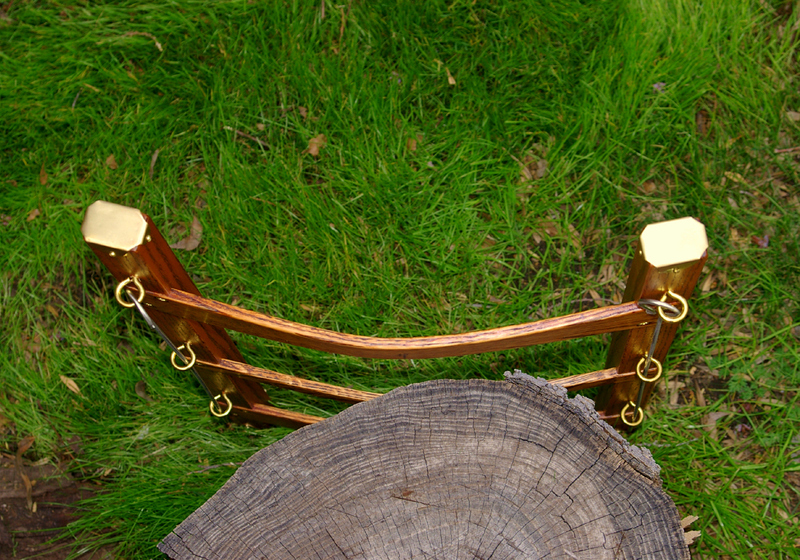 The bags were attached to a frame like the one in my post using the steel rods through large brass grommets. If you check out the Trager website you’ll find photos of the original Trapper Nelson to compare yours with. There were many versions of the Trapper Nelson pack and though they were patented, I’ve seen many old packs that look identical. Why is it that everyone thinks that everything was invented in the USA ? This wood framed packboard was being used by James Cameron Dun-waters (1864-1939), a Scot who moved to Fintry, British Columbia in the Okanagan in 1909. When he volunteered in WWI, he introduced the technology to the British army who were struggling with back-packing all sorts of heavy items up to the front lines, like ammunition, food, and water. I recently saw one his packs, with a Pioneer brand right beside it. Whether he thought it up himself or got the idea from local Indians, I do not know. But invented and patented by “Trapper Nelson” in 1924 ? Yea, like Edison invented the light bulb. Well he didn’t. And America didn’t invent the telephone, the paint roller, the zipper, Standard Time and insulin. Read Ralph Nader’s book “Canada Firsts”…not everything was invented by americans. Great story, though. But invented and patented by “Trapper Nelson” in 1924 ? Yea, like Edison invented the light bulb. is interesting. It may be argued that Nelson did not actually “invent” the pack but as you can clearly see in one of the illustrations in my post, he did in fact patent the Trapper Nelson. I don’t know if he ever saw a British Army pack in the Great War or not. I don’t even know if Lloyd Nelson served in the war. As Captain Dun-Waters did not manufacture, market or advertise his pack, how would an American even know that it existed? Sadly, because Dun-Waters did not patent or market his idea, he is not generally remembered for the contribution. I own thirty-five antiquarian books on camping and woodcraft, most of which were published between 1877 and 1916 and none name, describe or illustrate a Dun-Waters Yukon style pack or name Dun-Waters as having inventing such a pack – none. Apparently, in the popular literature of the period, nothing whatsoever was known about his pack. Even Warren Hastings Miller, the most “technical-gear” enthusiast of his time, makes no mention of Captain Dun-Waters or his pack. Note that a current Google search of James Cameron Dun-Waters, James Dun-Waters packboard, James Dun-Waters pack, James Dun-Waters Yukon pack and James Dun-Waters Trapper Nelson finds no more than a single reference – a personal blog (Jim Taylor’s Weblog). A search under “WWI British Army Yukon pack” found only a single post on Bushcraft UK, including photos of an “All British Yukon pack” sold by Blacks (this pack is quite similar to a Trapper Nelson but features a different bag design and frame attachment). I could find no online reference to Captain Dun-Waters creation of a pack in the Friends of Fintry biography of Dun-Waters or in his online obituary on Find a Grave. In addition, I could find no reference regarding his publishing a pamphlet on the Yukon pack. Apparently, I am not the only one unaware of the Captain’s packboard. It appears that the Canadians writing his biography and obituary and the English folk who subscribe to a forum specifically about traditional outdoor methods and equipment, and who’s own forces apparently used packs of his design are equally unaware of it. And I have a newly restored #3 packboard but need a new bag! Good luck in your search! Brent, I have one of these vintage packboards with the canvas bag attached. I have no idea what I have, but its in mint condition. It was gave to me by my father who is now going on 70. Is it possible to send you some pictures and you can help me out with identifying it? Thanks. This is fantastic! Beautiful work! Charles Trager was my great-grandfather, and I worked summers in the Trager factory in downtown Seattle in the ’80’s. My grandfather, George Trager, and I assembled the last official TNIP in 1985, not too long before he passed away. It resides in my attic, alongside a very early Lloyd Nelson model. Charles Trager lucked out. Lloyd Nelson copped a very ancient idea from the natives, and a perfect storm of forest fires, a rising middle class with more free time to hike, a region rich in national parks and mountains conspired to make this an icon for my family’s company and the world. The TNIP was a key spark for the outdoor recreation industry, and its impact can still be felt today. Otzi and Dun-Waters may have come across the idea earlier, but I’d be willing to bet that they weren’t the only ones. Charles Trager knew nothing of either of them, and certainly wasn’t out screw them. He was a guy who learned to work leather in the tanneries of Gloversville, NY and came out west at 15 to seek his fortune and ended up making bags, gloves, apron, and gold pokes for the Yukon gold rush prospectors. He was however, brave enough to take a risk or two, run with it thru improvements and mass production techniques, and it paid off. To somehow try to cheapen my family’s and Lloyd Nelsons contributions to the industry is insulting. I agree about sullying the name of Nelson, Trager or the Trapper Nelson. These were very influential packs! I often have to remind folks that the Trapper Nelson packboard was used on the successful American ascent of Mount Everest in 1963. I still have not managed to make or have someone make a bag for my frame. It’s still on my list of things to do but if you have an old pattern you could share with me it would help! BTW, I used to own a T.H.A.W. sleeping bag back in the ’70’s that was handed down to me by one of my college professors. Think it was made in the mid-’60’s. Hi there Brent, I actually have an old pack that I have been planning to take apart and pattern, so that I can make replacement packs. If you are still looking for someone to make a replacement pack for you, I can do it. I have years of industrial sewing experience in tents, tipis and luggage. Sewing is my business! I joined BSA Troop 172 in Seattle in 62 or 63. We were a large and very active troop and always had patrols that one various events at Camporees and FirstAideorees. We also did overnight hikes or camp out’s all throughout the school year and a wee long camp in the summers. At one point in I’d guess 1965 we had over 85 members. A large number of us used Trapper Nelsons often rented from REI. At the time REI was coming out with their “Cruiser Packs” with aluminum frames. They were nice but my old Trapper served me well then and later with a pack basket attached when I trapped many years later. I also with the pack and at times without hauled game animals out of the woods. I wish I still had it. It became a casualty of suddenly missing items in a divorce. I currently own a well used totally serviceable Trapper Nelson. My first was purchased at the original REI in Seattle in 1962 when I was in the Boy Scouts. It somehow disappeared during a divorce. I replaced it with my current one. Ive considered making or modifying a more modern pack to attach to the grommets on the pack board. If I had a machine I’d buy the canvas and see up a larger bag and modernize with possible side pockets or just an array of mollee attachment points. I’m interested to see what you come up with. Over the years I’ve gone on hike hunts with a short 12 gauge and a carbine at the same time with my trusty pack. I am still working on this project and I will post some pictures when I complete it. I have a Indian pack board by Trager and guess what? It is for sale! I believe it is all original and is in fantastic condition. Great work! Can you tell me the dimensions of the side rails and cross braces? Side rails are 1 1/2″x2″ red oak lumber, 26″ long. Of course, I was matching the side rails to an existing pack frame. If I were making my own I would have lengthened the frame by three inches or so. Top and bottom braces are 2″x1/4″ steam bent oak. The middle brace is 1″x1/4″ oak. 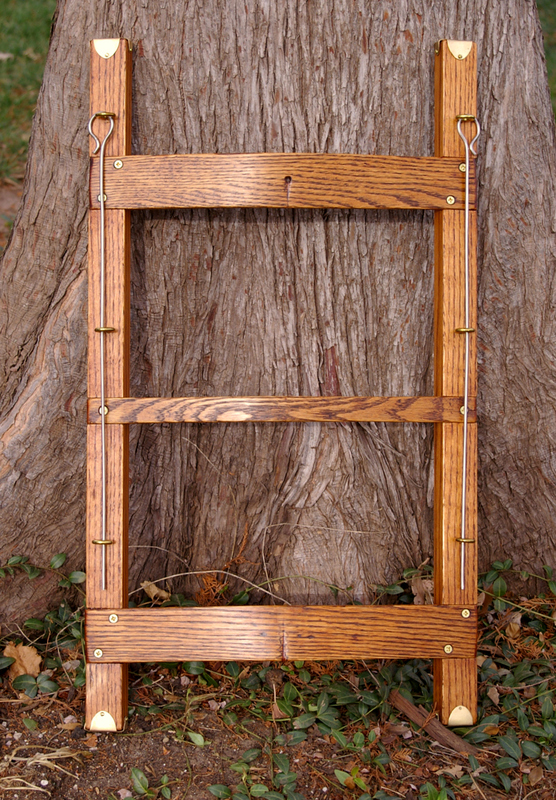 I don’t know if the original braces were red or white oak as they were very old and were darkened with age. I mixed a stain to match the color of the various components of the frame. Sorry – it is sold.